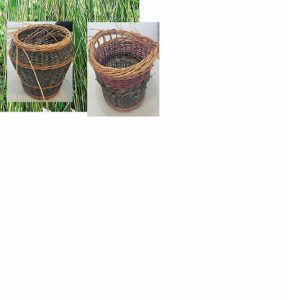 This two-day Summer Basketry Course is for beginners and improvers. It will help you try your hand (or extend your skills) at making a round willow basket. At this time of year, however, you will also learn how to make a colourful, decorative rush plait and explore a technique for incorporating them into your basket. The rush is the soft Juncus rush grown in Norfolk especially for rush basketry. Rush weaving is an ancient craft and most rewarding to do – the ultimate technique for combining creativity, colour, and a bit of counting too! If the weather is sunny, you might work out of doors in the garden adjacent to the Arthouse. In all eventualities, expect a weekend of hard, rewarding work plus good fun in excellent company. Jane is a highly experienced willow weaver and teacher. You can see examples of her beautiful work at www.specialbranchbaskets.com.